Mexico is resplendent with beautiful women. Living here as a single woman, I keep my ears open as to what my beautiful friends are up to, especially if the technique is unique to Mexico. While it may lose its sense of urgency as we grow older, our desire as women to look our best is something we never outgrow. Maintaining our exterior selves becomes a "value-added" proposition to our spirit, compassion and outlook on life. I have been delighted to learn that I can occasionally indulge in a few procedures in Mexico that I have probably would not be able to invest in at home in the U.S.
My aesthetician in Denver, Kenna, who is passionate on the subject of beauty, is always interested in hearing my news from Mexico too. “Other countries are always years ahead of the U.S. in products and techniques,’ she once told me. The FDA approval process is slow and made slower still by commercial interests that impede competition. One of the reasons I like exploring services and products in Mexico is that I simply don't trust that competing commercial interests don't interfere with our choices in the U.S., especially when I read the amount of money at stake. Incidentally, Botox-maker Allergan made $502 MILLION in a single quarter last year on the product. Botox accounts for billions in company profit overall. Billions. Murder money. With those stakes, one has to wonder if the pharmaceutical giant is behind the lack of availability in the U.S for some alternative products and treatments. An example is Platelet Rich Plasma Therapy, which uses your own enriched blood to smooth the skin. While much can be found on the risks of Botox, you have to look hard to find anything negative on Platelet Rich Plasma Therapy, which has been hailed by the National Spine and Pain Centers as a “revolutionary treatment for pain in the back, neck and shoulders.' Much has been written about its use by injured athletes. We will get back to that. Here are a few other beauty products or procedures to try in Mexico. Lumigan - Ironically also made by Allergan, the drops offer the same benefits as Latisse but is available from pharmacies without a prescription in Mexico for about $45 a bottle, about half the cost of Latisse (picture: my results). I use a fine tip artist’s brush to dot it above my lashes. It takes only one drop to treat both lashes and eyebrows (before this product, my eye brows looked like apostrophes). As with Latisse, the only risk is a chance of turning blue eyes brown without proper application. I love this product. Barra - Mexican clay for exfoliation and facial masks, available in in botanicas (botanic stores) in a variety of types their colors; pink, black, brownish -red indicating their mineral properties. Mineral clay has been used cosmetically for thousands of years. Clays detoxify pores, tighten the skin, exfoliate and moisturize. You can buy it by quantity at botanical stores. Fermodyl is a reconstructive serum (there are five types) for the hair and comes in a box of four ampules. This amazing product is the first I’ve found that will repair and give my fine hair shine without weighing it down. Available for about $5 a box at Walmart. They also make a very good Keratin Treatment which is applied with your curling iron and costs about $15 as opposed to the $200 my friends pay in salons in Denver, although the benefits do not last as long as a salon's. Yeah, I admit the bottom one has seen a little use. Retin-A – an excellent wrinkle reducer, I have paid anywhere from $15 to $120 for Retin-A in the U.S, plus going through the dubious process of finding a doctor with a sense of humor about writing a prescription to treat my ‘acne; (its official use) to get my insurance to cover it. Tubes of Retin-A can be purchased over the counter at a pharmacy in Mexico for less than $5. At that price, my friends here joke that we can bathe in it. Botox – If you still want to go this route, Botox injections cost about half in Mexico. I had injections to my forehead and crow’s feet by a dermatologist here for $250. It was the best Botox treatment I’d ever had – I definitely got my money’s worth. Dentistry – Thousands of people go to Mexico for dental work, which has gotten outrageously expensive in the U.S. (even though the most common procedures have been fundamentally the same for 40 years). I love sweets and suffer the consequences. I happened to be passing through Tijuana on my way back to Mexico a few months ago. A friend of mine in San Diego took me to the dentist he ferries people to on the other side of the border. The dentists office was high-tech and well-staffed. Two attractive young dentists replaced two fillings and cleaned my teeth for $150. I am sure there are equally good dentists in Mazatlán but I couldn't resist the urge to experience my friend's side business first-hand, taking people to dentists' and doctors' offices, or their pets to vets. Considerable savings exist across the board in all types of dental procedures, as thousands of people living in border states who and go back and forth all the time can attest. Platelet Rich Therapy – I initially learned about "The Vampire Facial" after admiring my friend Lupita’s beautiful skin. It's best to schedule these treatments with a few weeks between sessions. I finally found the right place and did three last year. I will do them again too. The process uses your own blood to stimulate collagen growth. PRP injections are prepared from one or two tubes of your own blood with strict aseptic technique. After being centrifuged, the plasma is injected via largely tiny pen-like needles, releasing growth factors. You can be treated anywhere, including hands. Side affects are minimal; you are using your own blood plasma, to which you will have no reaction. PRP therapy is more known for its use in treating injuries. Since Botox loses its effectiveness after a while, in addition to the whole scary neurotoxin issue, this therapy an appealing substitute. I have done it three times and was thrilled with the results as for my overall skin texture, although Botox still does better for crows-feet. Lip, Eye-brow and Eye-liner Tatooing - Are your lips fading out? Maybe it's because the heat melts off make-up in nothing flat living in Mexico that many women have their lips tatooed in natural pinks and mauves. Most women only outline their lips but some have their entire lips stained. Eye-liner and lip-lining tatooing - ouch! The color fades by about half after a few days. In watching it being done on a couple of friends, it seemed a little painful, like getting any tatoo, but as my friend told me, "15 minutes of pain to never have to wear lipstick again is a pretty good trade-off." The procedure can be done at your home (practitioners of many services, from massages to hair-coloring, will come to your home in Mexico) and will probably cost about $50 (only a little more than a tube of Lancome lipstick). Thermage - is a FDA-approved laser therapy for tightening the skin. The heat is said to stimulate latent collagen growth. I recently discovered a salon here in Mazatlan that offers the treatment and plan on checking it out. I researched that the procedure costs $2,000-3,000 dollars in the U.S. and about $800 (dollars) in Mexico. Next up: Working from Mexico offered me all the same write-offs, plus a lower cost of living. Most recent: Moving to Mexico put me back in control, the master of my fate. Over 300 language websites were researched for the Guide, with takes you to the best free features and sites through interactive links. Use it on either side of the border, studying from your laptop, e-reader or tablet (like the new Kindle Fire). 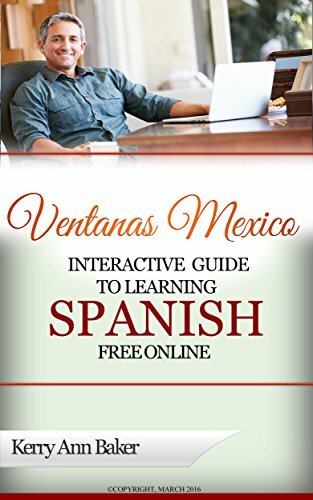 Recently, she released "If Only I Had a Place" a guide to renting in Mexico for aspiring expats (includes a list of rental concierges in Mexico's most popular destinations.